The Batman Begins special edition DVD package contains a flash drive with various production photos, and an additional image of a Gotham Historical Trust plaque. 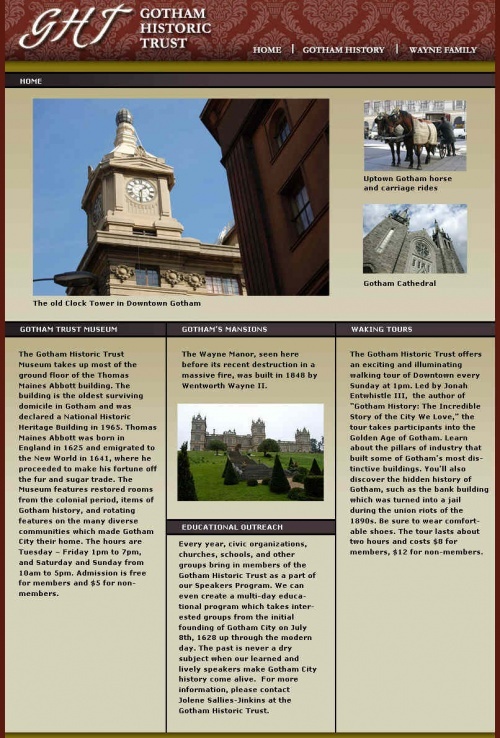 The Gotham National Bank site also refers to Gothamhistorictrust.com. 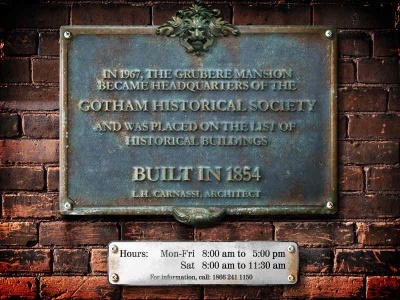 In 1967, the Grubere Mansion became headquarters of the Gotham Historical Society and was placed on the list of historical buildings. Thank you for calling the Gotham Historic Trust. Nobody can answer your call right now, but you are welcome to visit our website at www gothamhistorictrust dot com where you can find our current hours of operation, information and online exhibits of Gotham City in days gone by. Thank you for calling. This page was last modified 13:24, 11 July 2008. This page has been accessed 11,937 times.